Centuries ago, the lucrative spice trade forced prosperous nations around the world to explore alternative routes to new sources of these precious goods. These nations have gone in search of exotic lands. This is how the famous Spice Islands were discovered, where the most precious spices in the world were found. This discovery also led to other explorations, competition... and later, war! 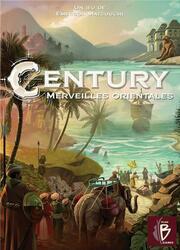 Century - Merveilles Orientales is a standalone, which can be combined with Century. It brings new mechanics, an additional richness and another design.